This is a large, 9", uncommon nocturnal Philippine endemic. It is also one of the most unusual-looking birds! It has a huge beak and huge eyes, giving it a muppet-like look. It occurs in two color phases: rufous and brown. During the daytime, it is usually found perched with its face held up towards the sky so that it looks like a dead tree branch. This individual was in the trees just outside the lodge. 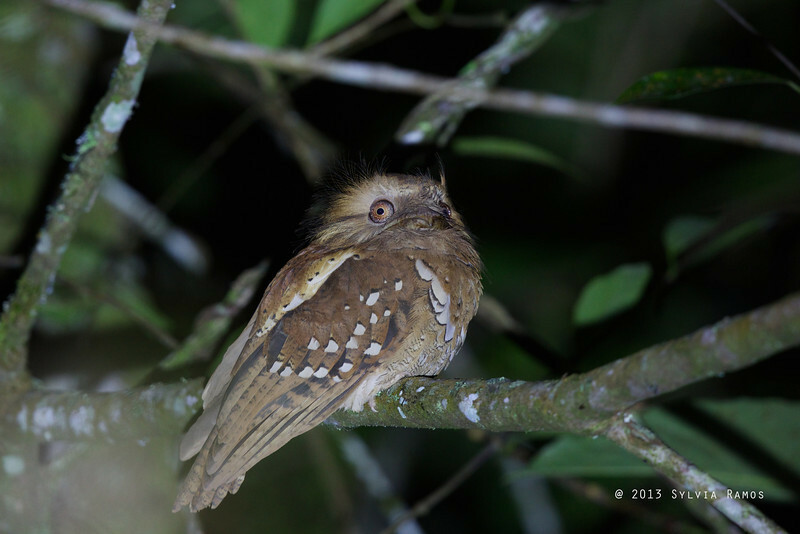 When we heard it calling, we followed Nicky Icarangal out into the muddy trail, in the dark to find this bird. This was one of the birds Franco wanted to see during our trip to Kitanglad. This was also one of the birds I REALLY wanted to see, after Nicky showed us the full frame with a point and shoot that he took of this bird. He showed us the picture during the Bird Fair in Davao and we decided right there and then to go to Mt. Kitanglad during Franco's next school break!